What will I be baking? 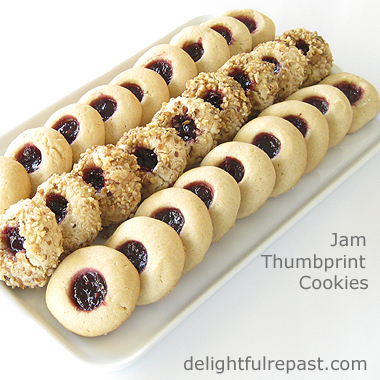 Why, thumbprint cookies, of course. They are traditional year-round cookies in our family. You can also shape the dough into logs, run a ditch down the center, fill it with jam, and after baking and partial cooling, cut the long into slices. We will bake molasses crinkles (with sorghum from near here instead of molasses), cutout cookies, Oblaten, and block gingerbread, an antique sort of super-spicy, long-keeping cookie. Well, Sully, you might just have to dip the dough balls in jam since you're a cookie-dough-eater. There are only two types of people in the world: those who eat cookie dough and those who do not! Natalie, good to hear from you! That sounds like a wonderful assortment of cookies -- though I'll have to look up Oblaten as I've not heard of that one. I'm sure I'd like all of them! They're so pretty! Of course I favor the ones with nuts, but all look delicious and look like they'd melt in my mouth! They're ones I should add to my Christmas list, to go along with spritz and English toffee. Thanks! Wow, Judy, "great minds" and all that -- I was just looking at your blog and commenting at the very same time you were at mine! Mr. Delightful especially likes the ones with nuts. It's been a gazillion years since I've made spritz cookies -- thanks for the reminder! Your cookies look absolutely perfect. I hadn't yet felt any urge to start holiday baking or even thinking about it. That's all changed down after thinking about filling up a tin with these lovely cookies! Aaaww, thanks, Big Rigs! I had made a batch to freeze as well, but they quickly disappeared! 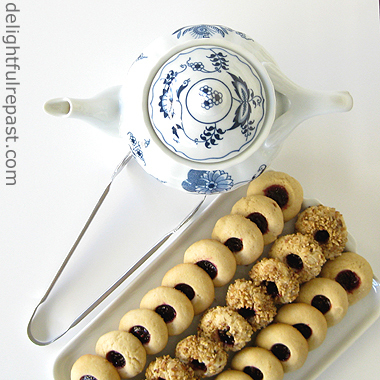 wow...and wow again...Jean, these jam filled cookies are almost too pretty to eat. And you are so right, they are not only delicious, also very festive. Thank you so much, Angie! I like that they're not overly sweet. I have never made these with nuts but I have made birds nest cookies which are similar with the nuts. They do look pretty either way and are delightful to nibble on with one's tea. 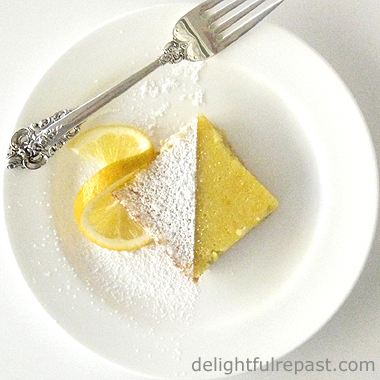 Thanks for sharing your recipe and have a wonderful weekend. Sandi, thank you! I'm having a cup of tea right now, but no cookies. :-( I hope you have a wonderful weekend, too! Perfect timing! I was thinking about what kind of cookies to make for the Great Scot's lunchbox next week. Those look wonderful Jean! Perfect in fact and so glad you shared! That's super, Jacqueline! Let me know how he likes them. Thos look just delicious! I have always enjoyed them at tea, and yours look wonderful! Thanks so much for linking to Tuesday Cuppa Tea! Ruth, thank you! Love checking out the tea posts! Thanks so much for linking to Momma Told Me. I always look forward to seeing what you've been working on! Hopefully we'll see you again next week! Rachel, thank you so much! You and Jen do a fabulous job with the link party. Feel free to holler for "halllllp" any time! If there's something I don't know in the kitchen, I'll be happy to research it or go in the kitchen and figure it out! Thanks, Margaret. And they're easy. You can mix them up one day and make them the next day if you want to. You could probably turn your recipe into Christmas wreaths too! Thanks, Carol! I love that you have your Aunt Tollie's recipe card. Such things are treasures. Looks like she was of the 'fill with jam after baking' school, while I'm of the 'jam *before* baking.' It's all good! Beautiful. Each season when I see these cookies I always think I should make them for the holidays. And I never had. You have inspired me to make a better effort. So pretty. Thank you, Lea Ann! I think you'll find they're a lot less fiddly to make than a lot of other "pretty" cookies. Greg, thank you for the 'lovely' comment!